1. Heat the oven to 350 degrees. Butter and flour an 18 x 12 x 1 1/2-inch sheet pan. 2. Cream the butter and sugar in the bowl of an electric mixer fitted with the paddle attachment on high speed, until light and fluffy. On medium speed, add the eggs, 2 at a time, then add the sour cream and vanilla. Scrape down the sides and stir until smooth. 3. Sift together the flour, cornstarch, salt, and baking soda in a bowl. With the mixer on low speed, add the flour mixture to the butter mixture until just combined. Pour into the prepared pan. Smooth the top with a spatula. Bake in the center of the oven for 20 to 30 minutes, until a toothpick comes out clean. Cool to room temperature. 4. For the icing, combine the butter, cream cheese, sugar, and vanilla in the bowl of an electric mixer fitted with the paddle attachment, mixing just until smooth. 5. Spread three fourths of the icing on the top of the cooled sheet cake. 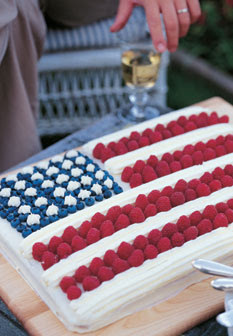 Outline the flag on the top of the cake with a toothpick. Fill the upper left corner with blueberries. Place 2 rows of raspberries across the top of the cake like a red stripe. Put the remaining icing in a pastry bag fitted with a star tip and pipe two rows of white stripes below the raspberries. Alternate rows of raspberries and icing until the flag is completed. Pipe stars on top of the blueberries. Enjoy it and Happy 4th of July !! 16 de julio de 2009, 10:34 p. m.
Es un postre genial para la fecha, por eso lo coloque... voy ver si el proximo año me animo y la hago. Gracias por visitarme. Soy nueva en esto y aun tengo miedo escenico, o mas bien "bloguero". 18 de julio de 2009, 2:00 p. m.
18 de julio de 2009, 7:03 p. m.
Hi Carlina! *I like your blog* I read many of the same blogs as you!!! I'll keep checking in and seeing how you are doing. 10 de septiembre de 2009, 12:32 p. m.
Hi Kim & Milton, thank you so much for visiting. I'm a little bit lazy these days, I'll try to post more frequently. 20 de septiembre de 2009, 11:59 a. m.